Martin, George R.R. (ed.). Wild Cards . Bantam/Spectra 1987. What if: In 1946, a genetically-tailored virus from outer space was released in Earth's stratosphere, killing many but giving super powers to others. Summary: The many effects of the virus during the ensuing decades as super-heroes and super-villains appear all over the world. Curiously, history isn't altered all that much. Series note: Long-time ongoing series of books, with as of late 2018, volumes one through 27 published or announced. Most are either edited or co-authored by Martin, but volume X gives sole cover credit to Melinda M. Snodgrass, volume XII to Victor Milan, and volume XVII to John J. Miller. (Note that due to change of publishers partway through the series, the cover numbering of volumes resets.) There are related comic book mini-series, one by Gregory Wright and Nelson Yomtov and another by Daniel Abraham and Eric Battle. There are also three role-playing sourcebooks for the GURPS role-playing game system, John J. Miller's GURPS Wild Cards , Kevin Andrew Murphy's GURPS Aces Abroad , and John J. Miller's Wild Cards: A Mutants & Masterminds Campaign Setting . Comments: Although called "mosaic novels," these volumes may be considered shared-world anthologies. However, individual entries for each story are not included in this bibliography. Within the overall series, plotlines are structured in (typically) groups of three volumes. Series note: First volume in the Wild Cards series. Comments: "Mosaic novel" composed of Howard Waldrop's "Thirty Minutes Over Broadway! ", Roger Zelazny's "The Sleeper", Walter Jon Williams' "Witness", Melinda M. Snodgrass's "Degradation Rites", George R.R. Martin's "Shell Games", Lewis Shiner's "The Long, Dark Night of Fortunato", Victor Milan's "Transfigurations", Leanne C. Harper and Edward Bryant's "Down Deep", Stephen Leigh's "Strings", John J. Miller's "Comes a Hunter", and Lewis Shiner's "Epilogue: Third Generation". Published: Bantam/Spectra 1987 (0553261908BUY); SFBC 1987; Titan 1989 (1852861584); ibooks 2001 (0743423801BUY), 2003 (0743475208BUY); Tor 2012 (0765365073BUY), 2017 (076539488XBUY). Translation: German of first half by Christian Jentzsch as Wild Cards 1: Vier Asse. Ein Mosaikroman , Heyne 1996 (3453109252). Translation: German of second half by Christian Jentzsch as Wild Cards 2: Asse und Joker. Ein Mosaikroman , Heyne 1996 (345310260). 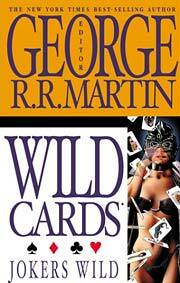 Series note: Second volume in the Wild Cards series. Comments: "Mosaic novel" composed of Roger Zelazny's "Ashes to Ashes", Pat Cadigan's "By Lost Ways", John J. Miller's "Half Past Dead", Walton Simons' "If Looks Could Kill", George R.R. Martin's "Jube", Walter Jon Williams' "Mr. Koyama's Comet", Lewis Shiner's "Pennies from Hell", Melinda M. Snodgrass' "Relative Difficulties", Walter Jon Williams' "Unto the Sixth Generation", George R. R. Martin's "Winter's Chill", and Victor Milan's "With a Little Help From His Friends". Published: Bantam/Spectra 1987 (0553264648w88 androidBUY); Titan 1989 (1852861592); ibooks 2001 (0743423917w88 androidBUY), 2005 (1596872837BUY). Translation: German of first half by Christian Jentzsch as Wild Cards 3: Asse hoch! Ein Mosaikroman , Heyne 1996 (3453109341). Translation: German of second half by Christian Jentzsch as Wild Cards 4: Schlechte Karten. Ein Mosaikroman , Heyne 1996 (3453109422). Martin, George R.R. (ed.). Wild Cards III: Jokers Wild . ibooks 2002. Series note: Third volume in the Wild Cards series. Published: Bantam/Spectra 1987 (0553266993BUY); Titan 1989 (1852861762); iBooks 2002 (0743434897BUY), 2005 (1596872845BUY); Tor 2014 (076536509XBUY). Translation: German by Christian Jentzsch as Wild Cards 5: Wilde Joker. Ein Mosaikroman , Heyne 1997 (3453119134). Series note: Fourth volume in the Wild Cards series. Comments: "Mosaic novel" composed of Stephen Leigh's "The Tint Of Hatred", George R.R. Martin's "The Journal of Xavier Desmond", John J. Miller's "Beasts of Burden", Leanne C. Harper's "Blood Rights". Gail Gerstner-Miller's "Down by the Nile", Walton Simons' "The Teardrop of India", Edward Bryant's "Down in the Dreamtime", Lewis Shiner's "Zero Hour", Victor Milan's "Puppets", Melinda M. Snodgrass's "Mirrors of the Soul", and Michael Cassutt's "Legends". Published: Bantam/Spectra 1988 (055327628XBUY); SFBC 1989; Titan 1990 (1852861770); iBooks 2002 (0743452410BUY). Translation: German by Christian Jentzsch as Wild Cards 6: Asse im Einsatz , Heyne 1997 (3453126653). Series note: Fifth volume in the Wild Cards series. Published: Bantam/Spectra 1988 (0553274635BUY); SFBC 1989; Titan 1990 (1852862750); iBooks 2003 (0743445449BUY); Tor 2015 (076533559XBUY). Translation: German of first half by Christian Jentzsch as Wild Cards 7: Nur Tote kennen Jokertown , Heyne 1998 (3453133218). Translation: German of second half by Christian Jentzsch as Wild Cards 8: Konzert für Sirenen und Serotonin , Heyne 1998 (345314001X). Series note: Sixth volume in the Wild Cards series. Published: Bantam/Spectra 1990 (0553282530BUY); SFBC 1990; Titan 1990 (1852862785); iBooks 2003 (0743458370BUY), 2005 (1596872829BUY); Tor 2017 (0765335603BUY). Translation: German of first half by Christian Jentzsch as Wild Cards 9: Terror und Dr. Tachyon , Heyne 1999 (3453149106). Translation: German of second half by Christian Jentzsch as Wild Cards 10: As in der Hinterland , Heyne 1999 (3453156420). Series note: Seventh volume in the Wild Cards series. Published: Bantam/Spectra 1990 (0553285696BUY); Tor 2017 (0765335611BUY). Series note: Eighth volume in the Wild Cards series. Series note: Ninth volume in the Wild Cards series. Series note: Tenth volume in the Wild Cards series edited by George R.R. Martin. 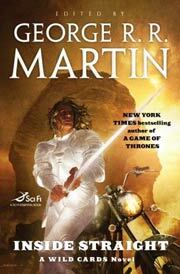 Series note: Eleventh volume in the Wild Cards series. Series note: Twelfth volume in the Wild Cards series edited by George R.R. Martin. Martin, George R.R. (ed.). Wild Cards: Card Sharks . Baen 1993. Series note: Thirteenth volume in the Wild Cards series. Comments: Due to a change in publisher, this was first marketed as "Book I of a New Cycle". Volume numbers previously included on covers of the series titles were dropped. Series note: Fourteenth volume in the Wild Cards series. 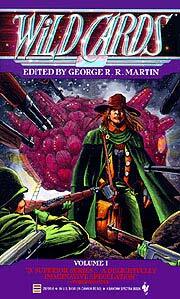 Published: Baen 1994 (0671722123w88 androidBUY). Series note: Fifteenth volume in the Wild Cards series. Series note: Sixteenth volume in the Wild Cards series. Published: ibooks 2002 (0743445058BUY), 2005 (1416507957BUY). Series note: Seventeenth volume in the Wild Cards series edited by George R.R. Martin. Martin, George R.R. (ed.). Wild Cards: Inside Straight . Tor 2008. Series note: Eighteenth volume in the Wild Cards series. Published: Tor 2008 (0765317818BUY, 0765357127BUY). Series note: Nineteenth volume in the Wild Cards series. Series note: Twentieth volume in the Wild Cards series. Series note: 21st volume in the Wild Cards series. Series note: 22nd volume in the Wild Cards series. Series note: 23rd volume in the Wild Cards series. Published: Tor 2016 (076533562XBUY), 2017 (0765335638BUY). Series note: 24th volume in the Wild Cards series. Series note: 25th volume in the Wild Cards series. Series note: 26th volume in the Wild Cards series. Series note: 27th volume in the Wild Cards series. Published: Harper/Voyager UK 2018 (0008283591BUY). Series note: Comic book graphic novel set in George R.R. Martin's Wild Cards universe, apparently fitting in between Wild Cards V: Down and Dirty and Wild Cards VI: Ace in the Hole . Comments: Issue 1 of the four comics was edited by Wright and the other three by Yomtov. Writing credit is given to various authors who wrote short stories for the books. Published: Four issue comic book mini-series, Epic Comics 1990. — Collected in one-volume, Epic Comics 1991 (0871357887BUY). Published: Six-issue comic book mini-series, April 2008 through May 2010 from Dabel Brothers and Dynamite Enterprises. — Omnibus volume, Dynamite Enterprises 2010 (1606901583BUY).